Summat Colliery is my first real attempt at a scenic layout, all my previous layouts have been very much of the train set type, radius 1 curves, foam underlay and minimal scenery. So when the Vicar of St Peter’s Church Mansfield suggested a model railway exhibition to raise funds I thought I’d better get a layout together. An appeal for a suitable layout on www.rmweb.co.uk produced two 8 foot by 2 foot boards with a track plan in place for what appeared to be a small terminus station. The arrangement was unusual in that one board had four hidden storage roads which served a sector plate on the other. Both boards had scenic break boards hiding the bits you’re not supposed to see. It had the advantage of being a blank canvas and was pre-wired for DCC. I really did not fancy the idea of just running small passenger trains into a station all day at a show so the idea of a shunting layout started to form. As I grew up next to a colliery it was decided to explore that possibility. I wanted to use buildings as scenic breaks to hide the sector plate and storage yards, these are far more effective even when the viewer can, if they try, see what is going on behind in my opinion. So a Walthers Mine building kit was ordered – an American HO structure, but as I found out later really captures the look of a UK colliery building. This was test assembled and the various parts arranged around/over the sector plate to find the best position. Once this was done there was no way back. So all systems go, I considered how the layout would operate and very soon another 4 foot non-scenic board was planned to allow loaded coal trains to exit off stage via a tunnel mouth though what was originally the station terminus. The other “road” allowing empty trains to arrive ready for loading. This would provide lots of opportunity for shunting empty wagons off scene and bringing full ones through the screens to the sidings ready for departure. Full wagons would move round the layout in a clockwise direction, from the storage roads through the screens to the sidings then off scene back to the storage roads via the tunnel. Empty ones would go round in the opposite direction. The planning stage was completed by adding a small engine shed where the bay platform would have been with coal stage and water tower to service a small steam shunter. It was at this point that the name for the layout came about. It is derived from the name of a long since gone colliery near my home called Summit Colliery in Kirkby-in-Ashfield and the local slang for “something” – I like to think it’s “summat” like a colliery! The period of the layout was firmly set in 1958 so that I could run a couple of pilot scheme diesels alongside my beloved Crosti boilered 9F – the real version went into storage in 1959 awaiting conversion to conventional form. The layout is of conventional construction, 2×1” softwood frames with 9mm ply tops covered in cork. The track is peco code 75 OO gauge with peco point motors underneath the boards. The track ended up being completely re-laid as I wanted to use PCB sleeper panels at the board edges to minimise damage in transit and to ensure a good join. During this process I found out that three of the points were code 100! These were replaced with new code 75 ones. Ballasting is again conventional with N gauge Woodlands Scenics ballast and cinders fixed in place with 50/50 PVA and water with a drop of washing up liquid. The three boards sit atop modified B&Q trestles and are held together with toggle catches positioned so that the two scenic boards can also be clipped to transport end panels to make a solid box – I didn’t want my hard work to be damaged in the car park! All this engineering has given me a layout that can be erected within an hour single handed without tools and too much fuss. As the layout was pre-wired for DCC it seemed rude not to carry on, so the wiring was finished, making sure that each track section had at least one pair of droppers down to the bus wires (domestic mains wiring cable). Point control is also DCC, a MERG pulsed accessory decoder board sits underneath both scenic boards to control the points on each section. These incorporate a powerful CDU and ensure the solenoids throw with a satisfying click every time. Frog switching of the live frog points is via external microswitches acting off the solenoid spindle. Peco PL13 switches were originally used but these proved too unreliable. 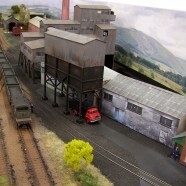 As this was my first attempt at a scenic layout I enlisted the help of my wife and the good folk on www.rmweb.co.uk. Many an evening was spent with one or two boards on the lounge floor deciding what would go where and what colour etc. The intention was to set what is a very industrial scene in a green landscape so the site of the old station gained some embankments running up to the tunnel mouth and the other end a gated hedge. Grassed areas are hanging basket liner with various scatters to add different tones. Plants and flowers are from various sources, some home made, some bought in. The tall feathery grasses at the front for example are made from some discarded bristles from a plastic dustpan brush, whereas the yellow flowers and ivy are made by miniNatur. The disused spur at the front of the layout was again my wife’s idea and took many evenings to get right, laying the track, then lifting it in much the same way as it would have happened in reality. This all had to be done before the main lines running by were ballasted so that the “new” ballast would lay over the old spur. Buildings were built up from various sources, the engine shed is a Ratio kit, the warehouse with loading platform and the long building behind the shed are from Metcalfe kits. The two buildings next to the screen building are scratchbuilt in card from images downloaded from the internet. Trees are mainly from SiSt Trees, including the quite expensive custom made silver birches that sit at both ends of the layout. I could have tried to make the trees myself but took the decision that if I was to finish in time for the Mansfield Show I would have to spend some money! – It’s always the way I find, balancing time and money when modelling. The photographic backscenes are from the I.D. Backscenes “Hills and Dales” range and I hope suggest spoil heaps as well as firmly planting the colliery in the countryside. Figures and fittings are a mix of Langley and Dart Castings offerings, a feature that always gets spotted at shows is the oil drum brazier that glows with an LED inside, I added a couple of figures sitting round drinking tea and sharing a joke to add to the scene. The colliery is manned by a couple of Hornby Austerity tank engines, Harry and #49. Harry was originally the only loco in steam but following a couple of shows it was clear that there was just too much running round coal wagons being done, so #49 was purchased to assist. #49 generally works off-scene taking empties away and bringing full ones to the screens. Harry tends to work in the full glare of the public drawing the full wagons through the screens and taking them to the concentration sidings. The Colliery also possesses an ancient 5 plank wagon that still bears the battered remnants of the colliery branding. Harry or #49 use this occasionally to take loco coal from the screens to the coal stage next to the engine shed. It was built from a Parkside kit and weathered following David Spencer’s article in Hornby Magazine December 2007. The unfitted 16 ton coal wagons and brake van are all Bachmann RTR renumbered and weathered by Dave Roome. Half are empty, the other half filled with crushed real coal held in place with 50/50 PVA and water mix. Stanier 8F – Hornby RTR, factory weathered, still running an R8215 decoder and possibly the best runner on the layout. Class 15 – a Dave Alexander kit, all my own work, even the weathering. Other locos from my collection make guest visits, so you can expect to see a Standard 5, Clan, 2-6-2 tank or even a Deltic Prototype from time to time. Automatic uncoupling is achieved using a stunningly simple and cheap system first made known to me by it’s inventor (if that’s the word) Brian Kirby on www.rmweb.co.uk It consists of a steel staple shaped and fixed to the bottom of the Bachmann coupling dropper. Powerful magnets under the track attract the steel staple but not the non ferrous hook, pulling the staple down and raising the hook, allowing uncoupling. This only works with Bachmann couplings, so I have standardised as much as possible. Where a Hornby coupling has to be used the hook is removed and coupling relies on the wagon hook alone. Pairs of magnets are positioned all over the layout at key locations. Carefully positioned figures give away the positions at the front, whereas blobs of white paint on the sleeper ends show where they are in the storage areas. The colliery has a single upper quadrant home signal to protect the national network from errant movements on the internal colliery lines. A very tricky MSE kit which operates via a servo control mechanism triggered from a switch on the catch point solenoid. The servo mechanism is very clever in that it gives the correct “bounce” when the signal drops on and the action is very slightly delayed from that of the catch point. I only get to play trains on Summat Colliery at exhibitions as in it’s full 12 foot length cannot be erected in my house. When it does get an invite though all the planning has paid off as there’s always something to do and the time flies. All too soon it’s time to pack up and go home! The layout is very reliable in operation, of course we get a few niggles but most problems are caused by the operators not lining up the sector plates correctly or running against a point not set correctly. Surprisingly only one loco has ever been derailed by the catch point by a loco SPADing the signal. Towards the end of the day a game of “see how fast we can run and get the uncoupling to work” breaks out which results in some very unrealistic shunting indeed and getting two or even three locos running at once with a single DCC handset can be interesting! I’ve had loads of fun both building and operating it over the last few years, taking in the Derby, Elizabethan, Wycrail and Churchrail shows as well as two of our own Mansfield Shows. I would welcome invites to take Summat Colliery to other shows in the future.